The BLS employment report shows the official unemployment rate ticked down 0.2 percentage points to 7.7%. While many cheer this report as a sign of recovery, the actual details are fairly ho hum. This article overviews and graphs the statistics from the Current Population Survey of the employment report and the below graph shows how far off we are from 2008. The graph also shows how the official unemployment rate is remaining stubbornly high. Don't let some fool you into thinking the job crisis is all over, it's not, not by a long shot. The labor participation rate dropped 0.1 percentage points to 63.5%. The labor participation rate is at artificial lows, where people needing a job are not being counted. A drop isn't good actually for it means that those who dropped out of the labor force are staying out of the labor force. For those claiming the low labor participation rate is just people retired, we proved that false by analyzing labor participation rates by age. The number of employed people is now 143,492,000 employed people in the U.S. We describe here why you shouldn't use the CPS figures on a month to month basis to determine actual job growth. These are people employed not actual jobs. In terms of labor flows, it's been static for the last five months, a gain of only 164,000 since October. From a year ago the employed have risen 1.473 million, but bear in mind population has also increased. The statistics from the CPS generally vary widely from month to month. Below is a graph of the Current Population Survey employed. Those unemployed stands at 12,032,000, a decline of 300 thousand from last month. Below is the change in unemployed and as we can see, this number also swings wildly on a month to month basis, so one shouldn't put too much stock in the month to month comparison. The number of people counted as unemployed has also remained fairly static. From a year ago the official unemployed has dropped by 771 thousand, yet for the last five months, the unemployed has only dropped by 216 thousand people. Below is a graph of the unemployed and we can see it's been fairly static as well. The civilian labor force is now 155,524,000, a decline of 130 thousand from last month. Notice in the graph below how many more people are in the labor force than at the start of the 2008 recession. Population increases every month and this post gives details on that increase, while this one describes BLS labor concepts as well as how many jobs are needed just to keep up with the increased population. Those not in the labor force now tallies to 89,304,000, an increase of 296 thousand from last month. Below is the change to show on a month to month basis, the CPS shows quite a bit of variance. We talk about the wild monthly CPS changes in this post. Below is a graph of the civilian labor force, in maroon, scale on left, against those not in the labor force, in blue, scale on right. Notice how those not in the labor force as a trend exceeds those considered employed and unemployed. What we see is a never ending growing segment of the population that is considered neither employed or unemployed, i.e. not in the labor force, increasing, above the trend line of those who would be naturally dropping out, such as the retired and those in school. Those considered employed as a ratio to the total Civilian noninstitutional population stands at 58.6% and is unchanged from last month. Below is a graph since 1980 to show how low this ratio is. This implies there are many people who could be part of the labor force who are not anymore. A huge problem with today's labor market is the gross number of working part-time generally. There are a huge number of people who need full-time jobs with benefits who can't get decent career oriented positions. Those forced into part time work is now 7,988,000, and increase of 15 thousand from last month. That is a hell of a lot of people stuck with part-time hours who need full-time work. Below is a graph of forced into part-time work because they got their hours cut, graphed as a percentage of the total employed. Part-time due to cut hours is known as slack work conditions and was 5,136,000 people, and an increased of 10 thousand from last month. Below is a graph of forced part-timers due to slack work conditions as a percentage of the civilian labor force. We think this graph is a recession economic indicator, and notice the slope matches strongly the gray recession bars of the graph. The percentage of people in working part-time due to slack economic conditions has stayed extremely high since the start of the Great Recession, even though it is overall clearly on a downward trend. U-6 is a broader measure of unemployment and includes the official unemployed, people working part-time hours because that's all they can get and a subgroup not counted in the labor force but are available for work and looked in the last 12 months. Believe this or not, the U-6 alternative unemployment rate still leaves out some people wanting a job who are not considered part of the labor force. U-6 declined 0.1 percentage points to 14.3%, in alignment with the official unemployment rate decline. The long term unemployed, or those unemployed for 27 weeks and over, stand at the incredible figure of 4,797,000 people and an increase of 89 thousand from last month. The long term unemployed are the crisis of our time and this figure just isn't decreasing and they are getting hired. The long term unemployed are now 40.2% of the total unemployed and this percentage increased 0.3 percentage points from last month. Behind this figure is economic devestation for almost 5 million people. The marginally attached are people not in the labor force because they have not looked for a job in the last month, but have looked for a job in the last year. This number has ballooned since 2007 and not returned to pre-recession levels. The graph below is the number of people considered marginally attached to the labor force, currently at 2.588 million. Discouraged workers are people, not counted as part of the civilian labor force, who not only want a job, but also looked for one in the last year. These people aren't job hunting now because they believe there are no jobs out there. Below is the graph of discouraged workers, currently at 885 thousand people and are a subset of the marginally attached. Discouraged workers is kind of a baramoter for how the job market is perceived. One of our favorite statistics from the CPS survey is how many people who are considered not in the labor force, want a job now. It is a direct survey question from the CPS. The survey asks people who are not being counted in the unemployment statistics and official unemployment rate if they want a job. The number who answer yes currently stands at 6,821,000. This is a 190 thousand person increase from last month. That's an astounding number of people not counted who report they actually want a job and roughly 2.4 million higher than before the recession. This figure includes the discouraged workers and marginally attached, but is seasonally adjusted, unlike the above. The average length of unemployment is now 36.9 weeks, an increase of 1.4 weeks from last month. This is still an absurdly long amount of time to be unemployed and has stayed highly elevated for years, an uptick is not what we want to see. The average duration is also so high due to the long-term unemployed, who clearly are having a hell of a time getting a job, many facing age discrimination. The median time one is unemployed, which means 50% of people have gotten a job in this amount of time, and is 17.8 weeks, an increase of 1.8 weeks from last month, again due to the increase in long term unemployed where the shorter term figures declined. Those unemployed less than five weeks dropped by 99 thousand, those unemployed between five weeks and 14 weeks dropped by 246 thousand and people who had been unemployed for 14 weeks to 26 weeks also dropped by 163,000. It is only the long term unemployed whose ranks increased this month. Below is a graph comparing the unemployed levels by duration going back to 2006. 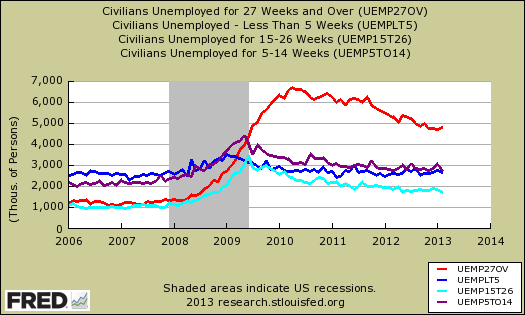 The long term unemployed is in red, those unemployed 15 to 26 weeks is in aqua, less than 5 weeks blue and those unemployed 5 to 14 weeks is in purple. What this graph shows is the the massive jobs slaughter of 2009, but notice as that great jobs slaughter went on, the long term unemployed diverged from those unemployed 15 to 26 weeks. Notice also how those unemployed for less than 15 weeks are returning to pre-recession levels, even with over five years of increased population growth. Yet those longer term unemployed are still highly elevated. This is a shuttering of a large segment of the American labor force into permanent economic destitution. 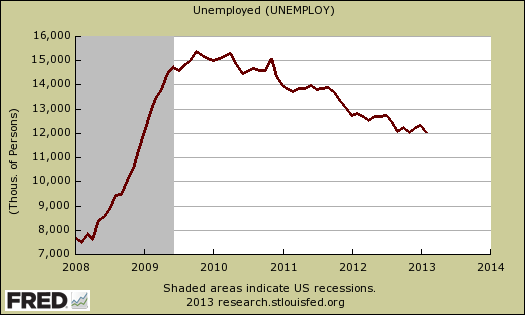 To show the divergence further, below are the changed in unemployed levels from January 2007 to February 2013. From the same time period the civilian non-institutional population has grown by 14.18 million people. These figures show how many people were just wasted by businesses as if they have no right to a job. Everyone should have a right to work, to earn a living in the United States but it seems those values were thrown out the window a long time ago. Here is last month's overview of the CPS unemployment statistics. This article describes the annual adjustments to payrolls. Absolutely amazing that population keeps on going up, more immigrants, labor participation rate goes down, and propagandists says things are good because of some trivial drop in unemployment rate. Saw somewhere else that numbers of people holding two jobs was really high - that's a great tell as to what kinds of jobs are being added (i.e., jobs that don't equal 40 hours + benefits by themselves). I like the JOLTS stats too. While 3+ people may officially be available per position, that ignores the fact that entire segments of the population are actually ignored completely (e.g., unemployed, over 40, veterans, etc.). So while 1000 people may apply for a certain position, in actuality, only 10 people are actually considered by HR. That's why at hiring events you always get stats that show it's harder to get a job at McDonald's than to enroll in Harvard - huge segments of the population will keep applying, never get hired, and the odds of getting a job decrease as few jobs are created. Some are claiming a third of that is retirement, but I don't think so, not from other LPR's by age and overall population growth figures. I need to dig in and do another detailed number crunching but generally speaking LPR is way too low. On job openings, every month I focus on how hiring has only increased < 20%, sometimes just 14% since the job slaughter low point of 2009. I think the hires rate is way more important than the openings rate, since we know corporations put out bogus job recs for which they have no intention of hiring anyone, or put out bogus job openings for which they fully intend to import a foreign guest worker exclusively for.